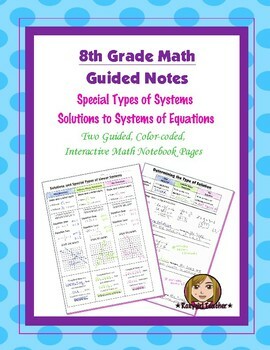 This is two 8th Grade Common Core guided, color-coded notebook pages for the Interactive Math Notebook on Special Types of Solutions to Systems of Equations. 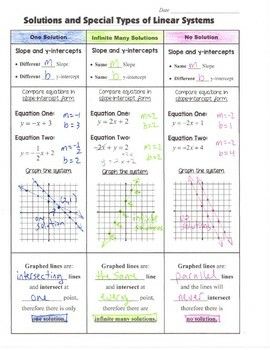 Included is a graphic organizer with the special types of solutions, examples of each graphically and algebraically and hints for each type of solution. 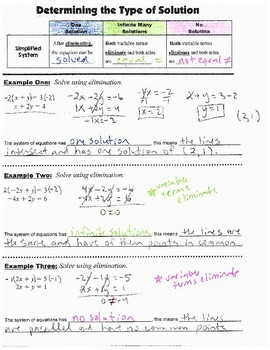 (One solution, No Solution and Infinite Many Solutions) And explicit notes on determining the type of solution using the elimination method.